Safety lock out stations for isolation of electical appliances and machinery are custom made here at safety solutions. The lock out stations come with bold headings to your individual specifications and act as a reminder to all personnel to lock out before commencing work. Lock out stations should be placed in a central location at the workplace for easy access to personnel. Lock out hasps ensure that the the electric on/off switch remains in the off position until the last padlock is removed; accordingly, several personnel can safely be working on the same electrical machinery whilst it is locked off. The machinery or appliance cannot be operated until the last person has removed their safety pad lock. Built for the tough conditions, lock out stations are made from top quality materials and come complete with plastic hanging hooks for padlocks and lock out hasps. 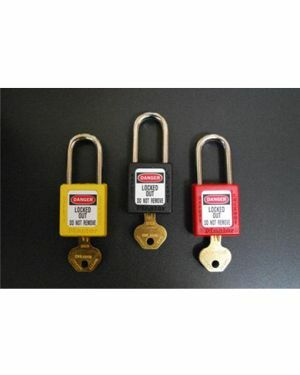 Separate safety lock out padlocks can be purchased in plain or colour coded format and are garanteed to be individual locks (no duplicates). We also supply individual lock out hasps and lock out tags. Standard lock out stations come with 5 or 10 padlocks; however, we can produce stations to order with as many as the customer requires. Corporate logos and/or safety slogans can be added to the station back plates.